How do you feel about the number of cars around your school gates? It's not just a safety worry if there are lots of them about when you're trying to get to school or go home. Vehicles are one of the biggest problems when it comes to air pollution. So should they be banned altogether? Take part in our vote and leave us a comment below. Amongst other pollution, exhaust waste from cars is a problem because the fumes can get into the air we breathe. Some pupils are so concerned, they're coming up with ways of trying to stop this happening outside school. Children at one primary in Greater Manchester are now patrolling the street outside their school and giving out fake parking tickets to anyone who stops on yellow lines or with their engine on. 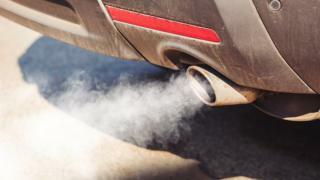 The fumes that come out of the back of car exhausts are bad for the lungs, especially for young children as with SUVs they are are right next to the exhaust and that is hurting our lungs. 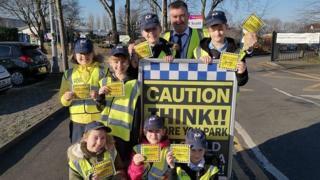 The kids are called "junior PCSOs" (a PCSO is a police community support officer). They started their campaign after the headteacher noticed the number of children with asthma had gone up - he thinks it could be because of air pollution. The headmaster said "It's great because it's made our children realise that if you do direct action like they are taking themselves with something that is effective as this it really can make a difference." They're not the only school trying to do something about it. When vehicles stop, but the engine is still running, this 'idling' means fumes still get in to the air which is then breathed in by pupils, parents and teachers (and anyone else in the area!). Air pollution can cause both short and long term effects on someone's health, especially for people with heart or lung conditions such as asthma. We'd love to know what you think. Are you doing anything at your school to tackle air pollution? Let us know in the comments below. Women and girls in science: How do scientists tackle air pollution? Pollution: How much do you know about the world's pollution? I think the parent or carer should drop the kids off near to the school but not right outside so that they can walk, scoot or cycle the rest of the way. This way, air pollution is reduced and the kids get to be active. Even if you live far away from school, you could find somewhere close to park that isn’t near school or on double yellow lines. I think only electric cars should be allowed near schools.